Ah yes, summer is in full swing! Many folks use their summer weekends fulfilling endless to-do lists in the yards or around the house and, from time-to-time the unsightly look of your unfinished deck and fences may draw your attention for some much needed restoration. You may be wondering how to approach cleaning your deck or fence to look new again; I have the tips you need to get your fence or deck ready for the summer! Not your regular household bleach but oxalic acid. Use this in conjunction with a power washer to remove the tannin’s in the wood that cause it to turn grey or black. Do this and seal the fence or deck for protection. Most wood fences are made with cedar and are easy to replace. Your local hardware store should have a variety of different boards to replace broken ones with. Just make sure you purchase the same species of wood, otherwise it will not look the same! 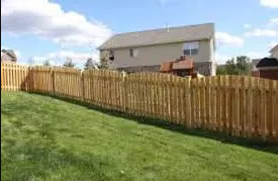 Adding a stain to your fence or deck not only provides an aesthetically pleasing look, it preserves the wood as well preventing costly premature replacement. Personally, I like to use Sikkens or Sherwin-Williams brands of stain as they provide a rich look that is easy to maintain. 4: Don’t Shovel your deck. If it snows where you live, don’t shovel the deck! Broom it instead to preserve the integrity of the deck stain you chose to apply. 5: Adjust your sprinkler heads. Watering your fence or deck will not help your garden look better….but it will help your deck and fence look worse! If at all possible, adjust the sprinkler heads to avoid spraying onto your fence and deck. Sometimes replacing the sprinkler heads with a different spray pattern is needed and your fence and deck will look better, longer if you do.